« They like me! They Really like me! Santa-lovers beware, this post is not for you. My husband hates Santa. Simply put, he creeps him out. I’ve tried to reason with the man, but for some reason my arguments never seem as valid once they become audible. None the less, these are a few of the statements we’ve each spouted to prove our own thoughts’ validity. He knows when they’re awake- I’m pretty sure neighboring countries know when our children have awoken. So really, the North Pole isn’t that much of a stretch. You can get your children to behave by spouting a simple, harmless lie. Behaving children? Check. Tricking them? Check! Lying to them? Double check! All the parently attributes I’d hoped to pass down to my young, impressionable children. Bringing your most precious gifts (your children) to sit on the lap of a strange old man with a beard, who may or may not smell like a liquor cabinet is not weird at all. It’s flat out creepy. Santa (and his consumerism) helps the economy! Your kid whispers what they want most in this world to a “santa.” Leaving you to buy every toy it could’ve possibly been, just so you can keep the faith alive. 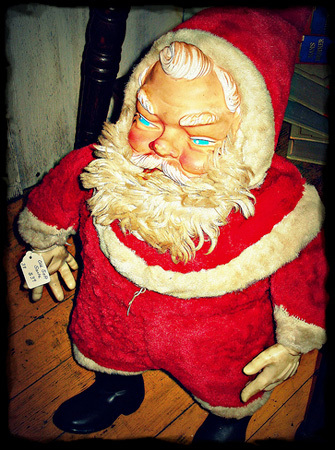 I googled Santa and came up with TONS of websites dedicated to pictures of creepy Santas. And they were definitely creepy. I think I could smell rum on a couple of them. There’s a Santa and Mrs. Clause speedo run all over the country every year. I think we can safely add Mrs. Clause to the do not watch list. He turns sweet, wild reindeer into prancing, flying slaves who perform his manual labor. If Santa would just hook up with social media things could be different. We’d be way less freaked out by someone who just twitters your tweets and pokes your posts… eh, maybe not. That Santa has a price tag on him. I’m simply shocked that no one has snapped him up. I’m thinking he’d be the perfect gift for those Chuckie fans on your list. He looks like he might murder them in their sleep. you’re totally right! Looking around, I realize that we don’t have any Santa things here… and I think I’m thankful! I love you!! If you get rid of Santa you can focus on what’s really important about the season! I’ve always thought of it like this: If I teach my kids that someone like Santa – who watches you all the time, knows when you’re sleeping or awake, knows if you’ve been bad (or good) and gives you presents that you probably don’t deserve – can’t be true, what does that teach them about God and Jesus – who watches you all the time, knows when you’re sleeping or awake, knows if you’ve been bad (or good) and gives you presents that you probably don’t deserve. I can’t tell them that in one instance, it’s stupid to think someone could or would do those things but then tell them that that is exactly what someone else does. we’ve never taught the kids to “believe” in santa. (I used to protest, but hubby was adamantly against it. I admit they are no worse for the wear, they still love santa movies and christmas… stuff. It’s still a magical, wonderful time for them.) That said, we do talk about the original story of santa that it stems from and how we need to take are of people who can’t take care of themselves, and help out families who don’t have the means. Along with the religious side of christmas. they’re very aware of that. haha, right?! Ok, so he doesn’t actually creep ME out (but hubby for sure! ), but I totally get why he does creep people out!